This page contains the links to all the posts CODA has published on Islam. “Reaction to Obama’s ISIL counterterrorism policy speech,” Sept. 14, 2014.“Obama announces U.S. ‘counterterrorism’ policy against ISIL,” Sept. 11, 2014. “Foreign jihadists: countries of origin and why they join,” Sept. 2, 2014. “France submits to Islam: 70% expect country to become Islamic,” Aug. 29, 2014. “Terrorism waiting to happen: Obama admin ignores Congress in lifting 30-yr. ban on Libyans training in U.S. flight schools,” Aug. 22, 2014. “Rockets fired by Hamas at Israel sometimes land in Gaza, killing Palestinian civilians,” Aug. 3, 2014. “While Nancy Pelosi calls Hamas a ‘humanitarian organization,’ Egyptian media applaud Israel for its war on Hamas,” Aug. 1, 2014. “Hamas’ objective: Get Israel to kill as many Palestinians as possible,” July 30, 2014. “Israel’s Iron Dome missile shield intercepts 90% of Hamas’ rockets,” July 28, 2014. “A sober look at ISIS’s declaration of a pan-Islamic state or caliphate,” July 4, 2014. “Obama admin’s secret war: 120 U.S. troops in Somalia,” July 3, 2014. “No good options for Obama as Iran and Russia jump into Iraq,” July 1, 2014. “ISIS announces Islamic caliphate is a reality,” June 30, 2014. “Obama admin trained ISIS jihadists in 2012,” June 19, 2014. “Obama ignored advice of military & CIA against Bergdahl prisoner swap,” June 9, 2014. “White House accidentally exposed identity of top CIA officer in Afghanistan,” May 26, 2014. “Obama administration’s DHS has a list of ‘hands off’ terrorists allowed to enter U.S.,” May 20, 2014. “Al Qaeda calls for car bomb attacks in U.S. cities,” May 9, 2014. 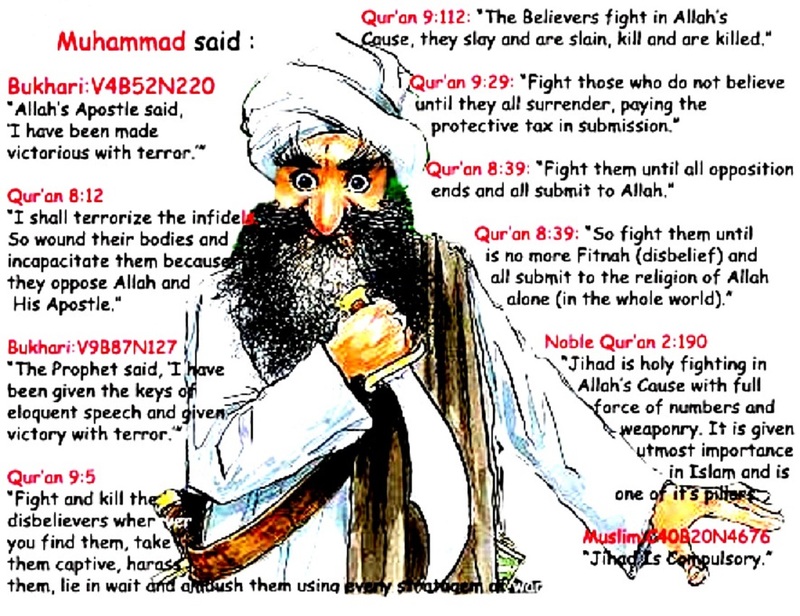 “Texas police officers are members of Mahmoudberg jihadist compound,” Feb. 23, 2014. “Egypt arrests U.S. embassy employee, member of Muslim Brotherhood,” Feb. 12, 2014. “Terrorists target America’s forests, reservoirs, and power grid,” Feb. 6, 2014. “Attack on California power station an act of terrorism,” Feb. 5, 2014. “Archbishop warns there are no “moderate” Syrian rebels,” Jan. 10, 2014. “FBI: Americans joining Syria’s jihadists,” Dec. 21, 2013. “Origins of the Syrian Civil War,” Dec. 11, 2013. “Pulitzer-award journalist says Obama admin made up intelligence for war on Syria,” Dec. 9, 2013. “The Iran “deal” summarized,” Dec. 1, 2013. “New rules of engagement hamstring U.S. troops in Afghan war,” Nov. 30, 2013. “Afghanistan to reintroduce stoning for adultery,” Nov. 25, 2013. “Somali jihadists al-Shabab revives, renews attack,” Nov. 21, 2013. “Elephants near extinction: Muslim jihadists profit from poaching fueled by Chinese buyers,” Nov. 15, 2013. “Syrian Muslims infected with Kuru, a disease of cannibals,” Nov. 12, 2013. “Forensic tests show Yasser Arafat was poisoned with radioactive polonium,” Nov. 7, 2013. “In reversal, Obama says he will boost US military support in Iraq,” Nov. 6, 2013. “US, NATO warn Turkey: Chinese-built air defense system not interoperable with NATO’s,” Nov. 5, 2013. “Al-Shabab jihadists recruit Somali youth in Minnesota,” Oct. 19, 2013. “NATO ally Turkey betrays 10 Iranian-Israeli agents to Iran,” Oct. 18, 2013. “Russia’s mounting internal crisis: declining population, radical Muslims, and China,” Oct. 14, 2013. “Iran claims its long-range missiles can reach Israel and U.S. bases in Gulf,” Oct. 14, 2013. “Iran claims its drones can fly deep into Israel,” Oct. 11, 2013. “Why is the U.S. National Park Service extolling Islam in a video?,” Oct. 11, 2013. “Global Jihad: Turkish jihadists join Syria’s civil war,” Oct. 9, 2013. “Obama and Congress may have created in Syria most deadly Islamic movement since 1990s,” Oct. 9, 2013. “Actual footage of 1993 Black Hawk down,” Oct. 8, 2013. “Get Your Programs Here, Can’t Tell Your Bad Guys Without Your Program,” Oct. 6, 2013. “Turkey selects China to build “stand-alone” air defense system,” Oct. 6, 2013. “CIA expands Obama-approved training of Syrian militants,” Oct. 4, 2o13. “Al-Shabab: Jihadist terrorists who attacked a Nairobi shopping mall,” Sept. 24, 2013. “Pakistani Taliban joining jihadist “rebels” in Syria civil war,” Sept. 24, 2013. “Iraq, once again, is spiraling into out-of-control violence,” Sept. 23, 2013. “Al Qaeda leader, assassinated by U.S. drone, was invited guest at DOD luncheon in 2002,” Sept. 17, 2013.